Microfinance Professor Saleha Khumawala, Ph.D (far left) accepts the Seeds of Hope Award along with her students, recognizing the work they are doing to prepare burgeoning entrepreneurs at the Independence Heights Neighborhood Centers Inc.
Editor’s note: This story is part of a series called “Bauer Gives Back,” which will run through the rest of the Fall 2013 semester. Bauer Gives Back highlights volunteer activities and charitable efforts of students, staff, faculty and alumni of the college. Houston has long been a city of entrepreneurial spirit, making comebacks after financial crises, hurricanes and booms and busts. Recently, a small Houston community in the Heights had the opportunity to take their own entrepreneurial spirit and transform it into a real-world business, with the help of Bauer students. Saleha Khumawala, Ph.D, microfinance professor at the C. T. Bauer College of Business at the University of Houston and her students have spent the past semester facilitating and teaching the Bauer Microfinance Program at the Independence Heights Neighborhood Centers Inc. The 12-week program reaches out to Houstonians with the goal of growing small and medium-sized businesses. The program also empowers families through financial literacy, encourages financial independence and facilitates access to checking accounts at little or no cost. With more than 25 percent of Houstonians living in poverty and about 9 percent of Houstonians living on less than $2 a day, the need for the program was apparent. Current program participants will be graduating on Dec. 7 with the hope that their new training will help them turn their business plans into a reality. A new session will begin at the Leonel Castillo Neighborhood Centers Inc. location on Feb. 8. 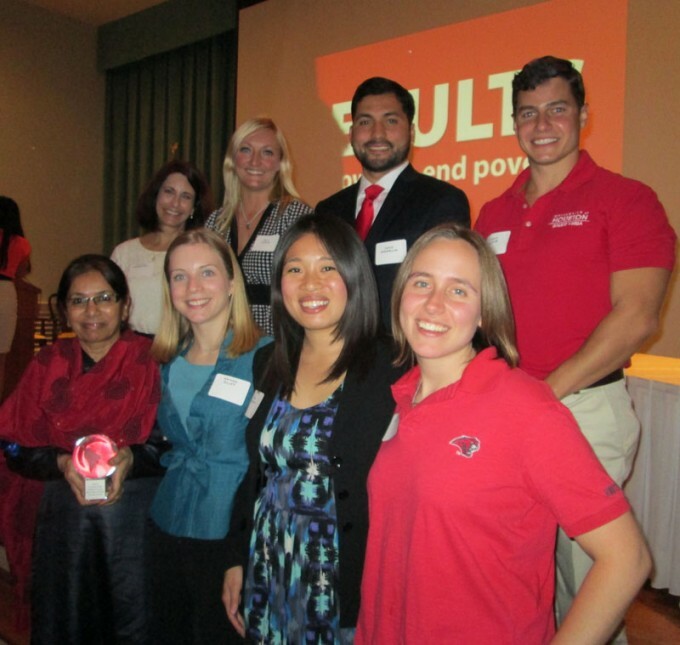 “We hope that our program participants can become microloan recipients and that their businesses contribute to the future of the Houston economy,” Khumawala said. The next installment of Bauer Gives Back will be posted on http://bauerticker.uh.edu/ on Monday, Dec. 9. Do you have a suggestion for someone who should be recognized? Email Communications Coordinator Amanda Sebesta at agsebesta@bauer.uh.edu.